The temperature regime of the upper part of the lithosphere is a result of thermal interaction with the environment (atmosphere, space, etc.) and with the underlying strata. The amount of heat arriving at the Earth from the atmosphere (mainly from the Sun) is approximately three orders of magnitude larger than that arriving from the interior. The process of heat transfer in ground proceeds generally through radiation, convection and conduction. Thermal radiation represents the process of emission of electromagnetic waves (radiant energy) by a heated body into the environment. The wave length corresponding to the highest value of emission by an absolutely black body is inversely related to its absolute temperature. The portion of heat transferred by radiation within the ground usually comprises less than a few percent of the value of the total heat flux. Heat transfer by convection, qcon, is carried out by liquid and gas flowing through pores, cavities and fissures in rocks, with the portion of the heat being transferred in the course of migration (diffusion) of moisture in soils usually being small compared with that being transferred by conduction. 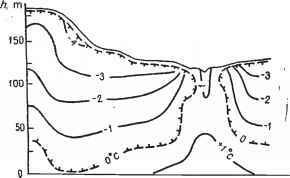 In the case of forced water and gas convection (infiltration) in faulted hard or coarse clastic rocks and sands the convective mechanism of heat transfer plays a significant role and the neglect of this mechanism may cause fundamental errors in the analysis of the temperature field. 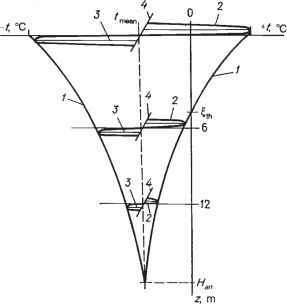 Account is taken of the convective component of thermal flux either through the effective thermal conductivity factor Xe(, covering the total heat transfer including convection and conduction or through the direct calculation of the thermal flux density q associated, for example, with the infiltration of water or pore solution: qcon = yw/fil vw where yw is the density of water; vw is its filtering rate and /fil is the specific relative heat content of the infiltrating water (solution). The main and the most basic mechanism of heat transfer in ground is conduction. Heat is conducted through the medium as a result of atomic and molecular vibrations in the crystal lattice, the intensity of which increase with temperature. This heat transfer occurs on account of the thermal conductivity of the material. From the mathematical point of view the process of stationary conductive heat transfer is depicted by Fourier's law: Qcood = grad t, where qcood is the density of the conductive component of thermal flux; X is the coefficient of heat conduction for the medium and is numerically equal to the amount of thermal energy passing through unit area per unit time with unit gradient of temperature. Fig. 1.1. Examples of graphical representation of temperature field: a - two-dimensional stationary; b - one-dimensional non-stationary. The 0°C isotherm is the boundary between unfrozen and frozen ground. 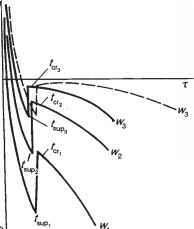 where a = A/Cvol the thermal diffusivity serving as an index of thermal inertia of the medium. The changes in the temperature field in time can be rather varied (from monotonic to spasmodic) in the case of a non-stationary thermal regime. 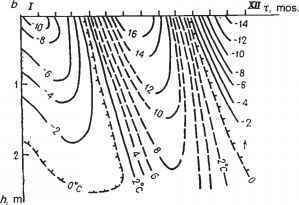 Fields which are periodic steady-state represent the most important case of non-stationary temperature fields under natural conditions. Their special feature is that the effect of the initial temperature distribution in the medium is virtually lost with the repeated temperature fluctuations on the surface. This distribution is so to say 'erased from the memory' of the medium and can be ignored beginning from some instant of time. It is this instant which points to the periodically stable regime of the process. where f(0, q) is the temperature at the ground surface changing in time; A0 is the physical amplitude of the fluctuation of this temperature (being equal to a half of the meteorological), in the annual (or daily or perennial) cycle; ean is the mean annual (mean daily or mean perennial) temperature at the ground surface around which the fluctuation with period T proceeds. Thus, the temperature fluctuations on the surface are uniquely determined by three values: ean, A0 and T.
Fig. 1.2. 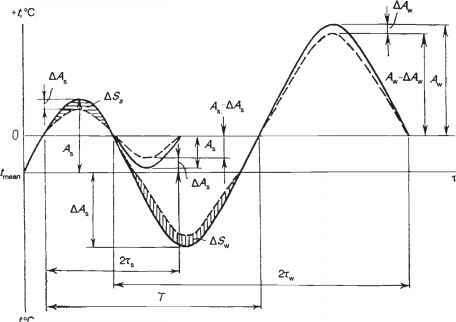 Harmonic temperature fluctuations on the surface and in the underlying ground: a - temperatures observed on the surface reduced to the 'ideal' sinusoidal fluctuation; b - temperature wave propagation in the ground: A - the amplitude of the fluctuation; <5- the time shift of the fluctuation St and S2 - areas of temperature, degree-hours, in warm and cold periods, respectively. ground of the surface temperature wave (perennial, annual and daily) is termed the depth of propagation of temperature fluctuation or the depth of zero (perennial, annual or daily) temperature amplitude. The near-surface ground delimited by these values of depth is termed the layer of perennial (n-year), annual or daily temperature fluctuations, respectively. This function determines the value of ground temperature at any depth z and in any instant of time x under the corresponding ground surface temperature change. It describes completely the steady-state periodic temperature field formed in ground as a result of sine-wave temperature fluctuations on the surface. On the basis of this solution we can conclude that the fluctuations around the same mean temperature i°ean and of the same period T as on the surface are established in the ground as well (see Fig. 1.2b). The more sophisticated treatment of the solution given allows us to state the following relationships known as Fourier's laws which are fundamental for the process of propagation of temperature waves into the ground. It follows from this relationship that the rate of damping out of temperature fluctuations with depth depends on the properties of the medium: the higher the heat conduction (the lower its thermal resistance) and the lower the heat capacity, the slower is the damping out and the greater the depth to which the temperature fluctuations penetrate (all other things being the same). Fig. 1.3. Nature of damping of temperature fluctuations with depth in ground. 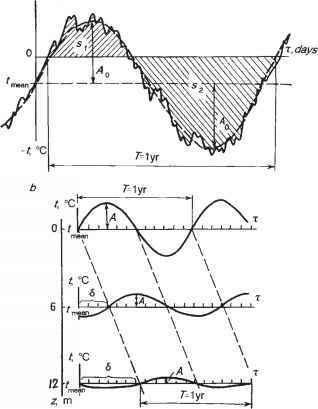 1 - envelope of temperature fluctuations; 2 - temperature fluctuations on the surface and at depths of 6 and 12 m; 3-4 - amplitudes of fluctuations and time axes at depths of 0, 6 and 12 m; mth is the depth of seasonal ground thawing; H. is the depth of annual temperature propagation. depth are confined to particular boundaries for each particular depth. These boundaries are segments of the exponential curves r°ean + A(z) where z varies in the range from 0 to the depth of zero annual amplitudes. Thus if actual data on temperature measurements in holes throughout a year are entered in one figure (Fig. 1.4), the synchronous temperature curves will so to speak 'fill' the area enveloped by the segments of the exponential curves. To show temperature changes with depth geocryologists often use these envelopes without presenting the particular temperature curves for the particular instant of time (see Fig. 1.3). Fig. 1.4. Nature of change of ground temperature (in a bore-hole) for various moments of time: 1-13 - temperature curves (1 - 30/IX, 2 - 15/X, 3 - 24/XI, 4 - 17/XII, 5 - 20/1,63/11,7 - 20/11, 8 - 24/111, 9 - 26/ IV, 10 - 2/VI, 11 - 26/VI, 12 - 27/VII, 13 - 29/VIII; 14 - the curves of the envelopes. See also Fig. 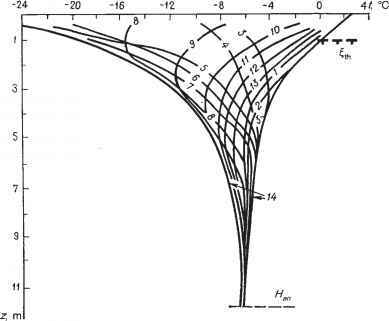 1.3.
limitation of the velocity of propagation of the wave through the ground.This velocity depends on the thermal-physical properties of the ground and on the period of the fluctuations; therefore it is constant with depth and with time for homogeneous ground. In line with this law of Fourier, the minimal winter temperatures at some depth z, for example, will be observed not at the moment of their occurrence on the surface but after the time necessary for the wave to reach this depth z. Therefore under natural conditions the following pattern is observed: when, for example, a period of cooling or warming begins in the near-surface portion of the ground the period of warming (or cooling, respectively) is still in progress in the middle part of the layer of the annual temperature fluctuation, while the period of cooling (or warming) of the previous temperature wave is observed in the lower portion of the layer (see Fig. 1.4, curves 8 and 10). Thus, given two temperature fluctuations at the ground surface of periods 1 year and 100 years, if it is known that the annual amplitude decreases by a factor of 10 at the depth of 10 m, it follows from expression (1.9) that the analogous damping of amplitude (by a factor of 10) of the 100-year fluctuation will occur at the depth of 100 m.
The geothermal gradient (g = q/X) shows, for a given location, how many degrees the temperature changes with a change of depth of a unit length. The inverse of the geothermal gradient is termed the geothermic depth. It shows at what distance along the vertical the ground temperature changes by 1 °C. The geothermic depth is often considered to be 33 m on the average within the continents, when approximate calculations are performed. In addition to vertical heat fluxes from the Earth's interior and the associated geothermal temperature gradients in the upper part of the lithosphere, there are also the lateral heat fluxes and consequently the lateral temperature gradients. Extremely high horizontal temperature gradients in rocks are observed at the boundaries between one topographic element and another having a different orientation relative to the Sun, higher or lower degree of slope and moisture content, between land and sea and lake basins as well as large water courses. In other words, there often exist not one-dimensional but two- and three-dimensional temperature fields in nature. The principles of formation of temperature fields are far more complex in moist soils and ground systems when their temperature passes through 0°C. This is associated with the fact that the processes of water freezing or ice thawing (water phase transitions) are accompanied by release or absorption of a great amount of heat which changes the temperature pattern fundamentally. By its nature it is not simply a process of cooling or heating of ground in this case but the far more complex process termed the process of freezing or thawing of moist ground. One should consider the very nature of moisture phase transitions in moist soil systems to understand and to analyze this process correctly. Moist soils are extremely complex in composition, structure, properties and interaction between their components and phases when the temperature passes through 0°C. All the natural waters are effectively solutions, i.e. consist of water molecules bound to a variable degree by solute ions. In soils this binding of water by ions is accompanied by an interaction with the active surfaces of mineral particles (adsorbed water) as well. Therefore when studying the structure and phase transitions of bound water in soils it is necessary to consider the model of free, bulk water texture serving as a primary standard for comparison. In line with A.A. Ananyan's, B.N.Dostovalov's, O.Ya. Samoylov's, Ya. I. Frenkel's and other researchers' developments the processes of ice - free water - vapour phase transition (the process of ice breaking down) can be represented in the following way (11). With the temperature of the ice close to 0°C each molecule situated at an ice lattice point has the minimal kinetic energy EK and the maximal activation energy, i.e. combined bond energy EB or the energy of interaction with the surrounding molecules. The EK value proves to be considerably less than the EB value in this case. Increase of the velocity of molecular movement occurs with heat input to the ice. The incoming energy can be expended to overcome the bonds between the particular molecules in the ice texture and to make molecules execute translational jumps when EK > EB. As the energy action continues, there comes a time when more than 9-13% of the hydrogen bonds are broken and the process of isothermal melting begins. The proportion of the broken hydrogen bonds is determined from the relation between the heats of melting (5.9 kJ mol~ *) and of sublimation (48.1 kJmol"1). The breaking of such an amount of hydrogen bonds of H20 molecules occurs as a result of the formation of a sufficient number of vacancies in ice crystal lattice points resulting from the increasing number of the translational jumps of molecules. As a consequence the symmetric and tracery ice structure with long-range order breaks, as it were, into pieces. At the same time the groups of molecules or associations no longer adjoining each other in such an orderly fashion as they were in the ice are separated or isolated in the crystal body. Two conditions should be fulfilled for the formation of such separated associations: 1) the obligatory breaking of a number of hydrogen bonds between the neighbouring molecules and along the contours of the water associations; 2) setting of the separated molecular groups ('pieces of ice') into vibration (Brownian motion) around their equilibrium centres. The latter occurs on account of the transmission of impulses of the H20 molecules. The increase of energy of the H20 rotation-vibration movement of molecules at points in the crystal lattice practically stops in this case. In connection with this there is no further increase of ice temperature with the continuing arrival of heat. In the course of ice melting the largest and the slowest associations of H20 molecules can be broken down and split into smaller ones under the effects of momentum of the individual translating molecules as well as of their groups. The total volume of ice and water decreases in this case while the density increases as a result of breaking of some of the tetrahedrons in the hexagonal ice texture and of penetration of their molecules into voids still persisting in the unbroken portions of the crystal lattice. The coordination number of molecules in such a system increases becoming more than 4, which is to say that the number of hydrogen bonds of each molecule increases, i.e. the activation energy increases. In other words, the further breaking of the associations stops, having reached on the average a certain critical mass, while the arriving heat is expended mainly in increasing the kinetic energy of the molecules in associations and of the associations themselves. The temperature of the system begins to rise, while melting and further breaking of hydrogen bonds stops. Based on the foregoing it is simple to consider the reverse course of the process, i.e. the transformation of water into ice (the process of water freezing). Thus, the number of translational jumps and the velocity of the diffusing H20 molecules and of the small water associations decreases with the extraction of heat from the water. The moment being imparted by the translating particles weakens. Vibrations of large molecular associations composing the skeleton of the structure of the water around the equilibrium centres slows down. The water temperature decreases as the natural result. The increasing sluggishness of the associations means the hydrogen bonds between H20 molecules are able to hold the associations and groups of molecules together. Brownian motion of the molecular associates slows down and then stops totally. Enlargement of the associations, their unification and their mean mass increase to the critical point and higher, i.e. transformation of the associations occurs, into the holocrystalline nuclei of ice which grow quickly and release heat of crystallization. Smaller associations as well as isolated diffusing H20 molecules begin to add themselves to these enlarged ones. Because the coordination number of H20 molecules is less in an ice lattice than in water and is equal to 4, as well as because ice crystallizes as a hexagonal crystal system characterized by the presence of free passages (holes), the volume of the system increases with the transition of water into ice while the density decreases. An expansion of water by 9% occurs on its transition into ice. The process of unification and enlargement of H20 associations and molecules discussed above is accompanied by the necessary formation of new hydrogen bonds between H20 molecules, naturally with the release of heat which must be removed from the system. Fig. 1.5. Temperature change with time (t) during supercooling fsup and crystallization fcr in (a) water and (b) freezing clay soil for various initial moisture contents Wl < W2 < W3 and constant heat removal rates, Q' (solid line) and Q2 (dotted line), Q'^Qy example, as soon as the temperature of ice crystals decreases, equalizing of the temperature in the system begins and the temperature of water in contact with the ice crystals must decrease. However the water cannot decrease its temperature in this case, because it will be transformed into ice (i.e. the binding of associations of H20 molecules can occur). In other words, any local lowering of temperature of the ice crystals or of the associations of H20 molecules will cause crystallization and transition of some portion of the water into ice. Consequently, the temperature of the system cannot decrease until the transition of all the water into ice occurs (Fig. 1.5a). That is the reason why the freezing process is isothermic. It is accompanied by intensive enlargement of the associations, characterized by Brownian motion and by the release of heat of crystallization. It can be assumed, however, that there can be conditions when freezing proceeds essentially instantaneously because of very fast heat removal from the freezing system. The heat of crystallization will not be released in this case because there will be no transformation of water texture into ice texture. Thus the texture of H20 is 'fixed' and a so-called amorphous (non-crystalline) ice texture is formed. One of the most complex and unclear problems in the theory of water crystallization is the problem of the establishment of the critical mass for the associations of H20 molecules when they become the crystal nuclei of ice, i.e. are transformed into full scale microcrystals as far as their texture is concerned. Investigations in recent years allow the assumption that this takes place at critical mass equal to 472 H20. The size of this unit ice cell is considered to be of the order of 10"20 cm3. When such a mass is reached, these associations can grow intensively and are the basis for the future crystal. The crystals usually grow radially from the centre of the nucleus. From the thermodynamic standpoint the additional forces binding the H20 molecules and associations into ice texture, i.e. formation of a centre or centres of crystallization, are necessary for the initiation of the crystallization process. There are two theories on the nature of ice microcrystal development. One of them (homogeneous) considers the formation of the crystallization centres as a regular process, with initiation of sufficient mass of the associations of H20 molecules resulting from the homogeneous temperature fall in the medium slowing down the molecular motion velocities with the joining together of molecules through hydrogen bonding. The heterogeneous theory of the initiation of ice crystals is based on the inevitable presence of foreign particles (impurities) in the melt (water) serving as natural seed crystals, i.e. as the crystallization centres. The heterogeneous theory does not rule out the theoretical possibility of homogeneous initiation of crystals. However as it is practically impossible to free water of the impurities it is these foreign particles which give rise to the crystallization in practice. Transition into a metastable state, reached when a liquid is supercooled to a temperature below its freezing point, is essential for the initiation of the homogeneous ice crystal. Such a unit crystal is formed spontaneously and its future depends on the degree of supercooling of the solution. The crystal will grow under sufficient supercooling of the system. Calculations show that the water can be in the metastable state in the temperature range between 0 and — 55 °C. It was possible to supercool distilled water to —12 to — 16°C and small drops of water to — 72°C in experiments. At such a temperature the crystallization is initiated in the whole volume of the drop at once. The supercooling of the volume of water does not usually exceed a few degrees and depends on the composition of the water, the background of its formation and the cooling rate. According to the heterogeneous theory the forced crystallization is caused by seed crystals, given the small oversaturation or supercooling of the melt. The best seed crystals are particles (impurities) of the growing crystal (ice) itself. The next best are particles of isomorphous substances able to give solid solutions with the crystal, i.e. the so-called gas hydrates and crystalline hydrates. Atoms or ions of such an impurity occupy the corners of the water crystal lattice. Salt crystals not soluble in water, various mechanical irregularities and substances giving regular aggregations with the growing crystal under certain conditions, can serve as seed crystals too. On the whole, all solid bodies having a structure similar to that of ice, must cause crystallization. The further growth of an ice crystal (after initiation of the nucleus) depends, on the one hand, on the particular features of the crystal-chemical structure and, on the other hand, on the conditions of its feeding. Thus, given the constant temperature gradient and the continuous increase of the growing crystal surface and, consequently, the increasing expenditures of energy on phase transition of water into ice, the water temperature around the crystal will rise slightly in the beginning, thereby slowing down its growth. Subsequently, lowering of the temperature with removal to outside the system of heat released in the course of water crystallization begins. In other words, the growth of ice crystals in water is likely to be spasmodic and cyclic in character. In response to the slight heating of water around the growing crystal and its further cooling, the differences in water density are able to cause temperature diffusion as well as diffusion of H20 molecules with a consequent inflow of mass to the various portions of the crystal causing its growth. The rate of growth around the crystal edges and vertices (corners) is proved to be higher than that near its planes, i.e. growth anisotropy is observed. Ice needles and stars are formed because the crystal vertices elongate more rapidly. Later on they grow together into a continuous mass holding their skeleton shape along the edges only (19). Under the conditions of one-sided uniform cooling this leads to selection and to primary growth of the crystals which are oriented in the most favourable direction. The crystals which are oriented in the less favourable direction are wedged out. At the same time if a growing crystal plane meets any foreign body it begins to push this body away with a certain force termed the crystallization force. In natural water containing dissolved salts differentiation (separation) of components is usually observed in the course of crystallization. In the course of cooling such a solution, molecules of salts as well as water molecules are organized into the elementary lattice. Separate formation of lattices of ice and of each salt occurs. Such a stratification is governed by the distinction between the crystallographic parameters of the ice and salt lattices. In the course of freezing the elementary lattices of salts are rejected to the boundary of the force field in which the ice crystal nucleus acts. Ice crystals usually contain a very small amount of salts, this being determined by the conditions of ice lattice formation. At the same time, the greater the crystallization rate, the greater the amount of salts captured by the crystal. The temperature of freezing (crystallization) £°cr of salt solution is lower than 0°C. The water possesses a store of energy of 636 J g ~1 while the ice possesses a store of energy of 302 Jg~1 at the temperature of 0°C. The difference in their stores of energy (334 Jg"1) represents the latent heat of fusion of ice. This heat, which is supplied from outside, is expended for the formation of the water lattice, i.e. for the change of the mean statistical distance between the H20 molecules in ice and in water. where Em is a variable value increasing exponentially as the mineral surface is approached and as the thickness of the bound water film h decreases, i.e Em =f[\/hn), where n is an exponent the value of which depends on the type of interaction between the water and substrate. Lowering of the bound water temperature down to tsup, equal to the supercooling temperature necessary to fulfil this condition, will depend on the value of the energy of bonding of the water by the mineral substrate Em. The more energetically bound the water is, the lower the temperature to which it must be supercooled. Accordingly the supercooling temperature is characterized by increasingly lower negative values with decreasing initial moisture content of the soil (Wx < W2 < W3) and, consequently, with decreasing thickness of the bound water films and associated increased energy of bonding between the H20 molecules and the mineral surface (see Fig. 1.5b). Thus bound water supercooling in the course of cooling of the soil, depends first of all on the necessity of removing this portion of water from the action of the mineral particle surface forces, whereas supercooling of the free water is required merely to form the first holocrystalline ice nuclei. It follows from this also that the surface energy depends on the temperature, i.e. that distance over which it is effective decreases with temperature. Thus once the ground system has reached a temperature equal to the temperature of the supercooled bound water (tsup < tj. "), the energetically less bound part is outside the effect of the surface forces of the ground particles resulting in the formation of the associations of individual H20 molecules and in their enlargement. The subsequent cessation of Brownian (vibratory) motion of the associations (as the heat is being removed from the system) will cause their transformation into the holocrystalline ice nuclei as well as the grouping of individual H20 molecules and small associations around these, or foreign, crystallization nuclei. At the same time additional supercooling is not needed for this process to proceed in bound soil water, because, on the one hand, the fulfilment of condition (1.12) provides for the necessary fall of temperature (to rsup < tj. "), and, on the other hand, the pore solution is characterized by the presence of a great number of foreign crystallization nuclei accelerating and enhancing the regrouping of water molecules into the ice texture. The process of new ice nuclei formation in bound water of the soil and their transformation into the ice crystals of full value as far as their texture is concerned will take place, naturally, with the release of the heat of phase transition. This will cause the spasmodic raising of temperature of the soil system and, consequently, of the bound water up to the temperature of the beginning of its freezing or crystallization f'c". The temperature at the beginning of bound water crystallization in soils depends on the value of bond energy between the soil moisture and the mineral surface Em. The experimental investigations show that the higher this energy is and the thinner the bound water film, the lower is the temperature value of the beginning of crystallization. Thus, the temperature of the beginning of water freezing in sands is determined by a high content of rather weakly bound (nearly free) water and it approaches the freezing temperature of the bulk (pure) water (fj." « 0°C). At this temperature all the free water proceeds to freeze in sands, and the duration of freezing depends on the moisture content of the sand and on the intensity of cooling. If the heat removal from the freezing sand sample is continued, its temperature will decrease only slowly to approximately — 0.5 to — 1 °C (Fig. 1.6) pointing to freezing out of the progressively more bound water, this being confirmed by the liberation of the crystallization heat in small amounts. The temperature of the beginning of bound water crystallization in clay-rich soils turns out to be essentially lower than that in sands and can reach, for example, values of the order of —2.5 to — 3.5°C in the montmorillonite clays with moisture content of 41-45%. One should take into account in this case that the presence of solute salts and exchange cations in the bound water of soils will also reduce the value tJ." The further removal of the heat of phase transition from the clay-rich system causes a gradual lowering of the negative temperature as the freezing out of the increasingly more energetically bound layers of water proceeds (see Fig. 1.6). Thus the moisture phase transitions and the liberation of the heat of crystallization proceed not under a particular, constant temperature but in a range of negative temperatures in sands (although little pronounced) as well as in clay-containing soils. It is not unreasonable in this case to highlight only the temperature of the beginning of bound water crystallization (r'c"). The duration of crystallization of bound water as well as of free water will depend on the rate of heat removal from the system. A higher rate of heat removal will cause more rapid freezing out of bound water which is shown by a sharper knee in the curve of the freezing soil temperature change (see Fig. 1.5b).